Windows Operating System may show you many different varieties of errors. But .dll errors are the most popular ones. 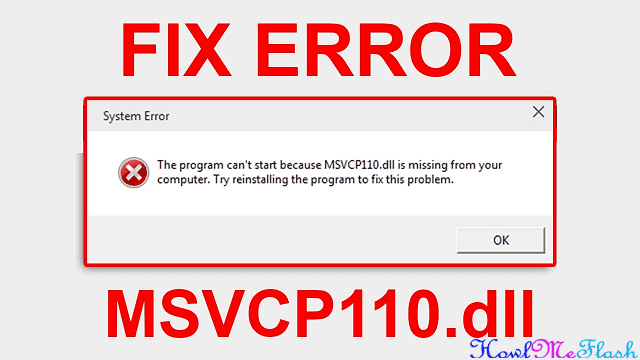 Most of the times Users face .dll errors while installing any program on thier pc, Today we will be discussing how to fix one of the Common error in windows which is Msvcp110.dll is missing from your computer. As said, windows can give you a pop up box displaying this error while you try to install any program. You must have seen an error box just like the above picture few minutes ago and that is why you are here. This Error may pop up even on Startup or Shutdown, As the message says, the .dll file is missing from your computer and hence you are getting this message box appear. But Let me tell you that you are on right place because i will be listing possible ways to fix this error. So now that we know the causes, lets move ahead and see how to fix Msvcp110.dll error. Make sure you have not accidently deleted msvcp110.dll file. Check your Recycle bin to make sure its not there. If you find it just restore and see if you get the error again. At the time you get this error box, you will see that there it says to try and reinstall the program. So i would suggest you to Try and reinstall the program and see if you get the error box again. This is some basic fix so you must perform this first and then move on to below advance fixes. Download Visual C++ Redistributable for Visual Studio from the Official Microsoft website. Install it once download. This step will replace the old corrupted msvcp110.dll file in most cases. You may now go further and try to install the program that was showing you the error. Most of the time this solves the issues for handful of users. If you have created System Restore point in your windows PC then this is the right time to Restore your System to Previous Point when your PC was working fine. This is why System restore is a very handy feature in Windows which most of the users fail to use. If any of the above Fixes doesn't solve your problem and you still get Msvcp110.dll is Missing from your Computer Error everytime you try to install the program then this indicates registry issues. I would recommend to Download Regserve The Registry Cleaner. These are important tools and so the good ones are not availabe for free. They will Cost some bucks but will keep your Pc Error Free and will prevent any registry corruption in future. I am assuming that by now you must have fixed the error and left. Oh you are still there? Try this, Scan your PC for Virus/Malware. Make sure to do a full scan with your favorite anti virus program. See if your anti-virus shows any issues with your Computer. So All the above 6 Steps failed to Solve or Fix your Issue of missing .dll file issue ? You will now want to reinstall Windows to fix this problem. Any Corrupt driver/files/registry will be fixed with reinstallation and must also fix the .dll file is missing problem for you. Finally if any of the above mentioned Steps helped you to fix the issue then Let me know in the Below Comment box which on really fixed your problem. Any other steps which i am missing here can also be shared in Comments that helped you to fix the error.